Around the world, kickboxing isn't just a full-contact sport — it's also often practiced for self-defence and, in recent years, general fitness. 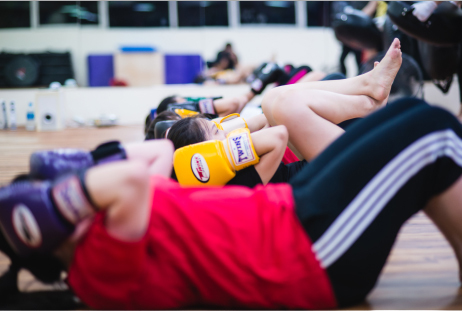 Combining hand-eye coordination, core control and cathartic moves, kickboxing is a great way to improve physical health and fitness, leading to weight loss, improved body strength and stress relief. At Active Red, our classes are done primarily for general fitness — the "fight" element has been removed from our Active Kickboxing programmes. Active Kickboxing classes are taught by highly-qualified and experienced instructors. Everyone can join our classes — NO EXPERIENCE IS NECESSARY. Our classes are done in pairs. If you don't have a partner, our instructors will make the necessary arrangements for you to be partnered with someone. It's a great way to meet new people... While working on your fitness goals! Kickboxing Fitness can be done by almost anyone. We have programmes to suit a wide range of needs and interests, from juniors and teenagers to adults, senior citizens and even athletes looking to improve their performance. •	Aerobic conditioning (speed training), achieved by working on handheld pads/bags at high reps with 30-40% maximum strength. Continuous punching and kicking on handheld pads and heavy bags at various speed and intensities over a period of time (e.g. 2 minutes) improves cardiorespiratory endurance. The intensity of these workouts will keep your heart rate up and the calories burning for a few hours after every class. Together with advice from our nutritionist*, you can expect further weight loss and achieve your desired body composition (weight and body fat percentage) in a few months! The handheld pads/bags act help replicate the effects of resistance training experienced in weight training — so you can also expect to reap the benefits of weight training. Our stretching sessions — before and after each class — will improve your flexibility and help you better execute your kickboxing moves. Accurately hitting and kickboxing handheld pads/bags will help you achieve better balance, hand-eye co-ordination, agility and reflexes. A Programme that will suit your specific need! You get to learn countless kickboxing combinations and drills. You will also get to focus on specific kickboxing techniques in every class. This complete body workout is great for anyone who wants to improve their cardiovascular fitness. Classes are structured into 3 main levels: Beginners, Intermediate and Advanced. This programme is endorsed under the Sports Education Programme (SEP). 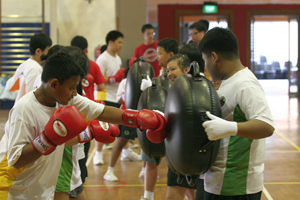 SEP is developed and administered by the Singapore Sports Council(SSC) and the Ministry of Education (MOE). This is a total body workout, just for women. Our Active Kickboxing Boot Camp classes are mixed with fun Active Kickboxing Fitness sessions plus exercises integrated with over 500 varieties of circuit training, toning, strength conditioning and band work. It's a great way to ramp up your existing workout, and a fun introduction to fitness if you're a newbie. Come have fun with your classmates and friends. You'll get to learn the basics of Kickboxing and self-defence, while de-stressing from the pressures of school life. After-school classes are available, and start at 4pm. Meticulously designed for the Active Ager (anyone over 50), we offer lots of simple exercises to improve your motor skills, cardiovascular fitness and overall strength. You will feel fitter and stronger in weeks. More importantly, you will experience improved overall well-being. 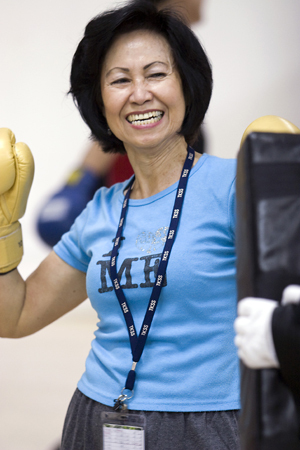 The Kickboxing equipment used are REAL and are especially and particularly good for senior folks – helping prevent osteoporosis and improving muscular strength and endurance. Our Kickboxing classes are conducted in small private groups of 10 to 14 people. 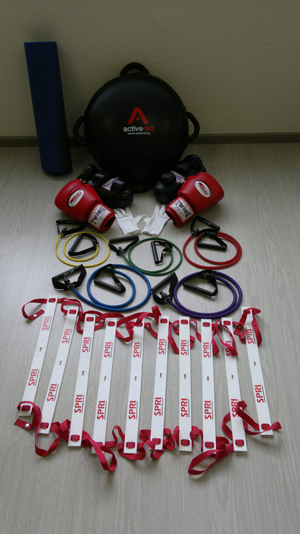 This is to ensure you experience personalised attention from our trainer — and to facilitate your learning and mastering of proper Kickboxing techniques. Classes are structured according to 4 progressive levels — Introductory, Beginner, Intermediate and Advanced. Your safety and wellbeing is most important to us — Introductory Sessions are mandatory for all new students. Our trainers will teach you the fundamentals of Kickboxing and the basic techniques needed to participate in our group sessions comfortably. This session is designed for all new Active Red clients, regardless of fitness levels and exercise backgrounds. There are unique differences in our Active Kickboxing Programs — equipment used, stances, class structure and terminology. Our trainer will also take this time to assess your current fitness level and exercise background. You will subsequently be advised on the appropriate class level to join — one that will best suit you. To book your introductory sessions, please contact us to find out about the next available session. To enhance your class experience, we recommend that you book sessions according to your current fitness level. We offer 2 to 3 sessions per week for each level, giving you the flexibility to book sessions to fit your schedule. Once you have purchased our standard 12-session package, you can book your sessions by contacting us. To ensure consistency and to help you remember your training day, we encourage you to fix your training day — for example, every Monday. Specially tailored for individuals who prefer a personalised Kickboxing workout programme, this is especially useful for executives who need the flexibility of fitting their workout sessions into their busy schedules. This is also great for individuals who want to learn and master the finer points of Kickboxing with one-on-one training. Working out with your friends is great fun. Private group sessions can be arranged for groups of 3 to 10 friends. Contact us for the lowdown on our friend-ly exercise programmes. Our sessions are great for social interaction and team bonding. Pop by Active Studio with your colleagues for a fun yet intense session. Or we can bring fitness to your office. Simply contact us for more information. As shower facilities are not available, you may want to bring extra towels for wipe downs after class. All payments to be made in full one week prior to commencement of classes.